Horse racing legend Secretariat was born at what is now The Meadow Event Park located just down the road from King's Dominion amusement park. This is a great option for a day trip from the Colonial Beach area. It takes roughly an hour to get there and I can tell you from first-hand experience, that visiting the birthplace of one of the greatest racehorses of all time is truly awe-inspiring and very moving. It's best to go on the weekend closest to his March 30th birthdate, as that's when there's usually a celebration and great people like Secretariat owner Penny Chenery, exercise rider Charlie Davis and jockey Ron Turcotte make appearances and sign autographs. I went to the event this year. I wanted to go in 2012, but the status of the venue was unknown at the time, so the birthday celebration was held at an alternate location. This year holds extra meaning as it is the 40th Anniversary of his Triple Crown victory! I thought it would be fun to have my picture taken with Penny, and in a roundabout way that's just what happened. I saw a picture of Penny in the Richmond Times-Dispatch the next day and there my hubby and I are in the background! Tram tours of the facility include stops at the foaling shed where he was born on March 30, 1970 as well as his stalls in the training barn and the yearling barn. The foaling shed was moved from the pasture behind the main house and barns to it's present spot. It's the actual shed he was born in, but not the actual location. "Rainaway" is a descendant and the mascot of the farm. He was brought back to health after being found in bad shape in Tennessee in 2007. Another descendant, "Covert Action" also sometimes makes an appearance. He can typically be found at the James River Correctional Center where he is part of their Greener Pastures program. I was able to see both of those horses in person, and it was wonderful to be in the presence of the grandkid and great-grandkid of the mighty Secretariat! He won the Triple Crown in 1973 and it had been 25 years since "Citation" did it in 1948. There are only 11 horses who have accomplished this feat. In 2012, "I'll Have Another" might have been the 12th, but he had to bow out due to an injury. THIRTY-ONE lengths separated Secretariat from the pack of horses behind him at Belmont that day and he won the race with an unmatched time of 2:24. He had a big heart, literally! His heart was 2 1/2 times bigger than an average thoroughbred horse heart! 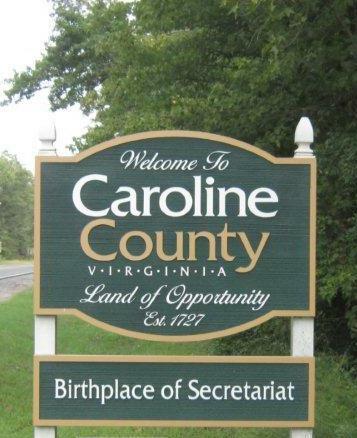 On your way to or from the birthplace site, stop by the Caroline County Visitor Center off I-95's exit 104. They have Secretariat's stride marked out on the sidewalk with painted horseshoes. There's also a gift shop full of memorabilia and souvenirs! A major motion picture was made about him and released in 2010, the year of his 40th birthday. The movie, by Disney, stars Diane Lane as Penny, John Malkovich as trainer Lucien Laurin and five different horses, one of which was "Trolley Boy" to play the part of our favorite thoroughbred. "Riva Ridge" was a stablemate of Secretariat and another Meadow Stable notable, winning both the Kentucky Derby and Belmont Stakes in 1972 and helping to keep the Meadow Stable operation afloat when it was in a bind. 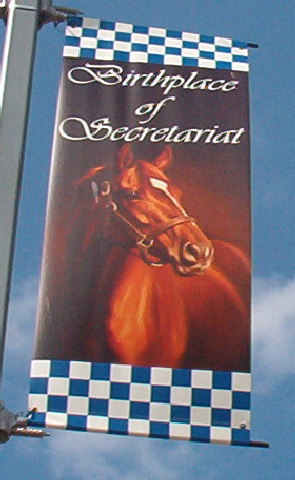 Pick up some or all of the books shown in the column at the right which are filled with pictures, interesting stories and interviews with those who were close to this superhorse. It's great fun to read about his personality quirks, his playful puppy side and what a ham he could be. Many of the stories are very touching and will surely bring a tear to your eye. I know they did for me. Secretariat died at the age of 19 from laminitis and is buried at Claiborne Farm in Paris, Kentucky near his sire, "Bold Ruler." He had the honor of being buried whole, instead of the traditional head, heart and hooves. His mother, "Somethingroyal" is buried at Meadow Stable (no marker) as is his grandmother (in the Horse Cemetery by the yearling barn).